The Ohio State University Department of Astronomy is engaged in leading-edge research that includes searches for planets around other stars using gravitational lensing, supermassive black holes, and clusters of galaxies; studying the evolution of stars and galaxies; the large-scale structure of the universe; and the origin of chemical elements in stars and the Big Bang. I always knew I wanted to be an astronomer, even when I was little, but it was Ohio State’s graduate program that made me an astronomer. In the mid-2020s, NASA will launch a new space telescope that can map the Milky Way galaxy and the distant universe 100 times faster than the famed Hubble Space Telescope. Ohio State researchers Scott Gaudi, Chris Hirata and David Weinberg have played major roles in developing the current design of the Wide Field Infrared Survey Telescope (WFIRST), and over the coming decade they will help NASA refine the mission and prepare to analyze the extraordinary cosmic maps it will send back to Earth. With three leading members of WFIRST’s Science Investigation Teams, Ohio State has “the largest scientific footprint in WFIRST of any university in the country,” according to Weinberg. Astronomer Scott Gaudi is directly involved in worldwide collaborations that hunt — and find planets that lay beyond our solar system, using the technique of gravitational lensing. 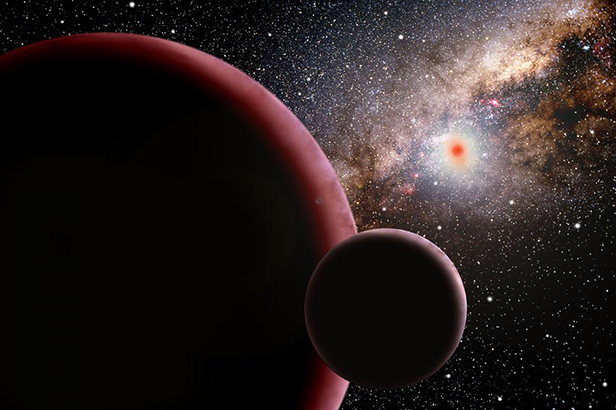 A recent NSF Faculty Early Career Development (CAREER) Award funds his efforts to create a new stellar map for these extrasolar planets. By comparing different research methods used to find them, he plans to stitch them together like a patchwork quilt to get a better global sense of their actual demographics. is sponsored by the department and the Center for Cosmology and Astroparticle Physics (CCAPP). It includes full-time, paid summer research positions in astrophysics with a faculty member in either astronomy or physics. Recent PhD recipients have received postdoctoral positions at the Harvard-Smithsonian Center for Astrophysics, the Carnegie Observatories, the Institute for Advanced Study, UC Santa Cruz, the Kavli Institute at the University of Chicago, Space Telescope Science Institute, UCLA, Herzberg Institute of Astrophysics, University of Leiden, Durham University, DARK Cosmology Centre at the Niels Bohn Institute, Los Cumbres Global Telescope Observatory in Santa Barbara, the National Optical Astronomy Observatories, and the Jet Propulsion Laboratory at Caltech. A collaboration between astronomy and physics to pursue research at the interface of cosmology, astrophysics and high-energy physics.